Over 150 prepackaged reports with built-in management actions. View complete details about all users, user accounts that have empty and duplicate attributes, and recently created, modified, or deleted users. View the status of user accounts including enabled and disabled users, accounts that have been locked out, smart card enabled user accounts, and more. View information about the true last logon time of user accounts in your organization without scripting in PowerShell. 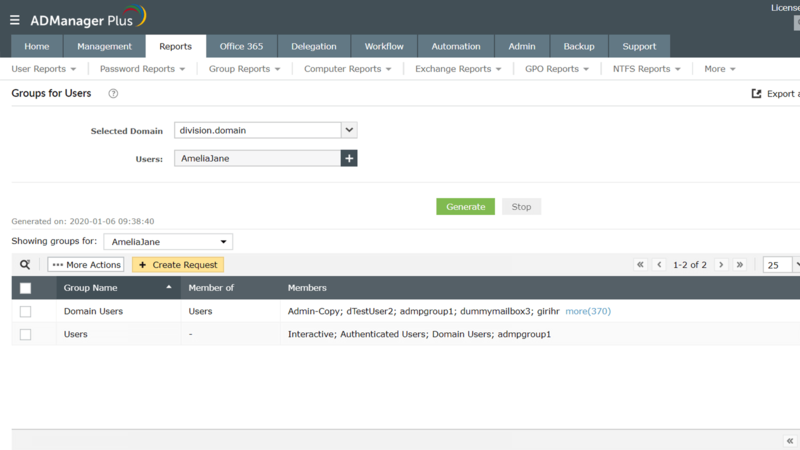 Identify AD users who have been inactive for a specified period of time and manage them right from the report. 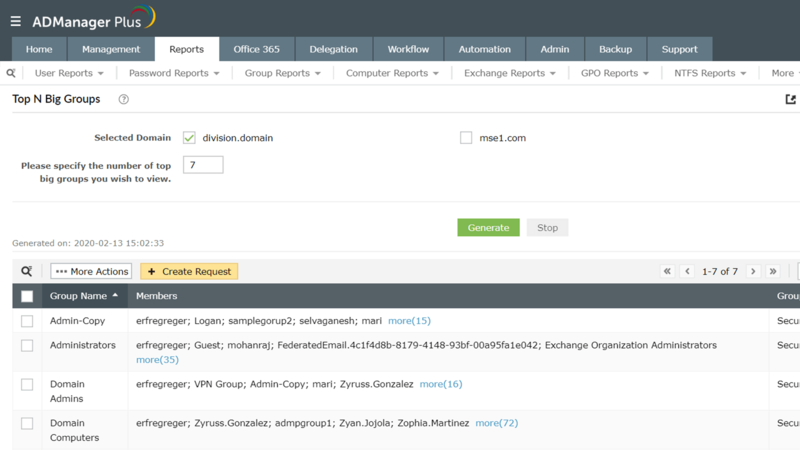 View information about users who have never logged on to the domain and avoid security attacks by managing them right from the report. Find out which users recently logged on based on their last logon time. 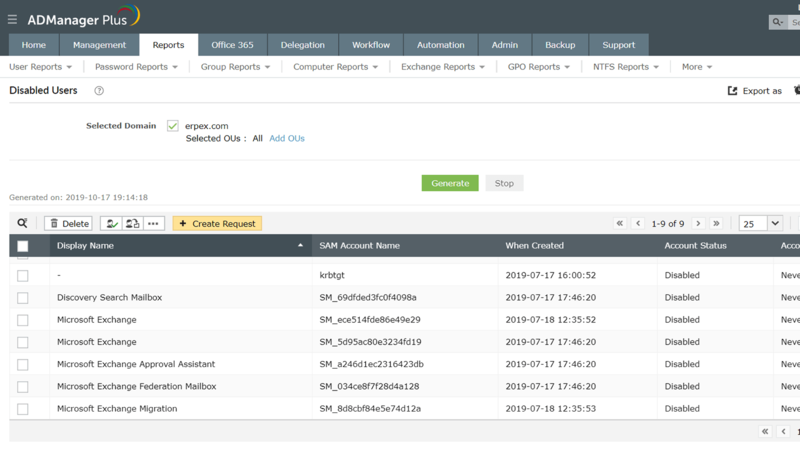 View general information about all user accounts in your organization. 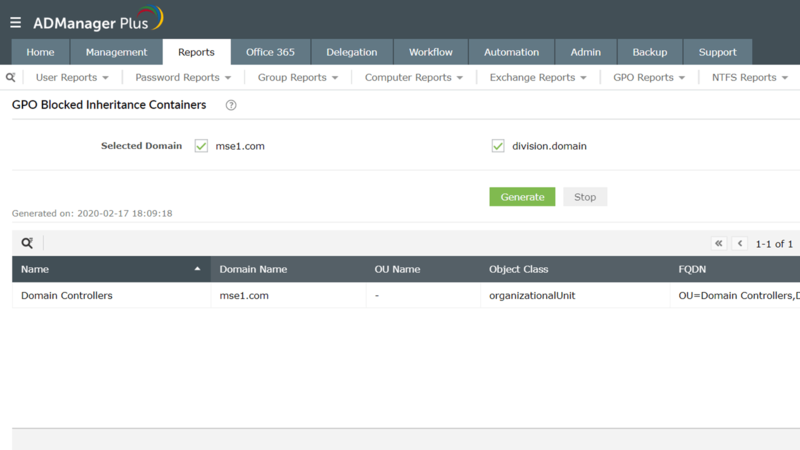 All users - View details about all users in selected domains. 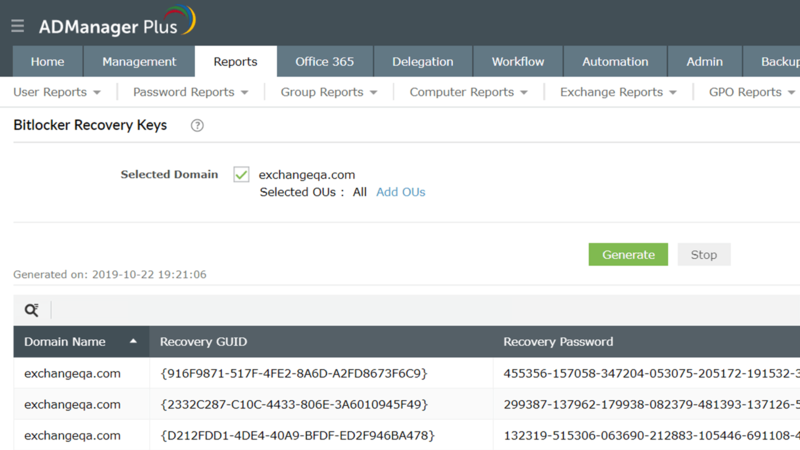 Recently updated users - Get details about recently created, modified, and deleted user accounts. Users with empty attributes - Identify users with blank attributes. Discover users who have been locked out due to an abnormal number of incorrect login attempts. Identify disabled accounts in order to delete them or move them to a different OU. Locate user accounts that are obsolete or are soon to be obsolete. 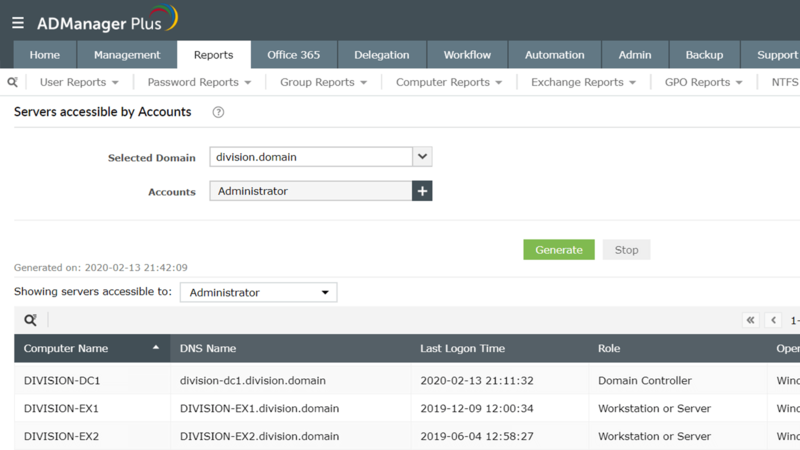 Depending on your organization's housekeeping policy, these reports will help you clean up your Active Directory (AD). They'll also help you save time by reducing the amount of PowerShell scripting you have to do. In a multiple domain controller (DC) environment, it's difficult to ascertain when a user last logged on. 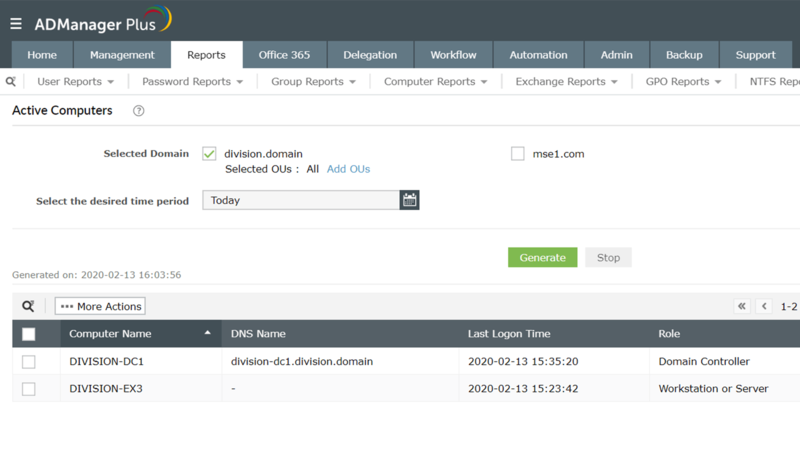 Each DC shows a different last logon time and using the native tools to discover the exact last logon time is complex and time-consuming. 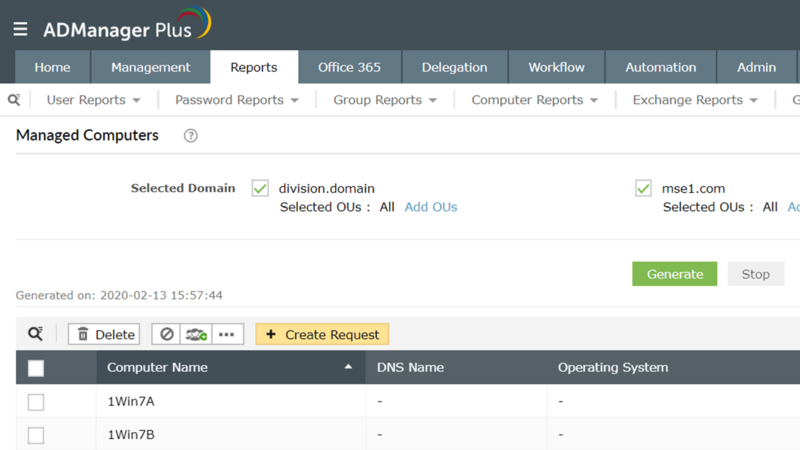 ADManager Plus queries all DCs in your environment to give you the exact last logon time for all users. 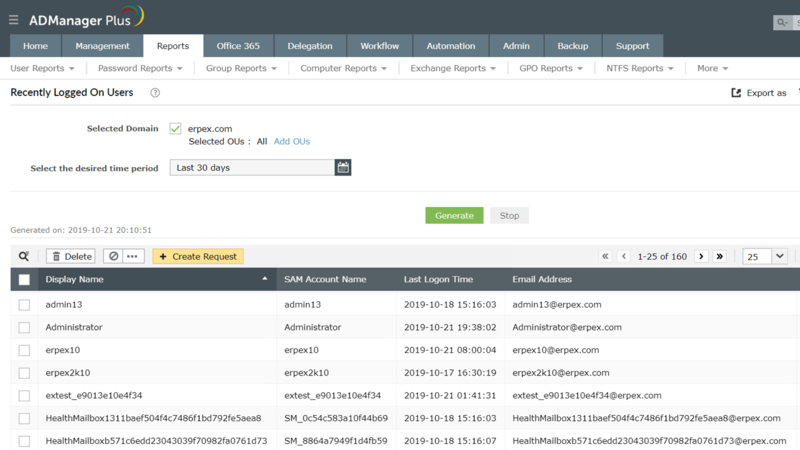 In addition to just viewing all the information pertaining to a user's last logon time, you can also perform management actions right from the report. You can disable, delete, or enable a user. 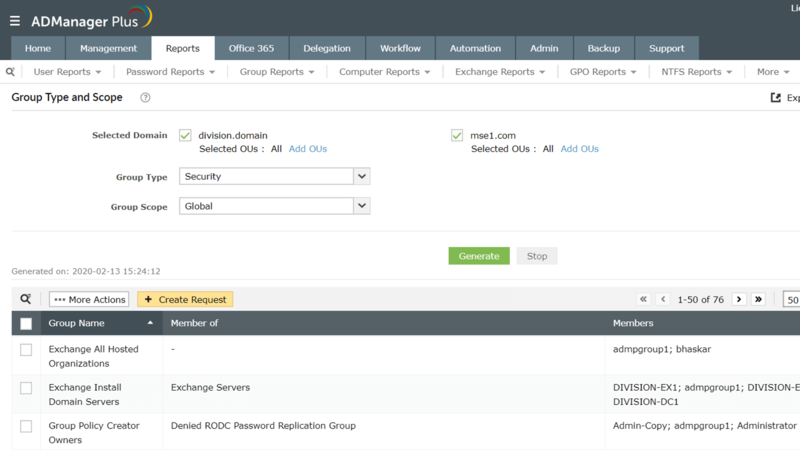 Reset users' passwords, unlock their accounts, allow or deny inherited permissions, create, archive, disable, or delete users' Exchange mailboxes, modify mail storage limits, and more. Using PowerShell and other native tools to discover inactive users is a time-consuming and complex process. 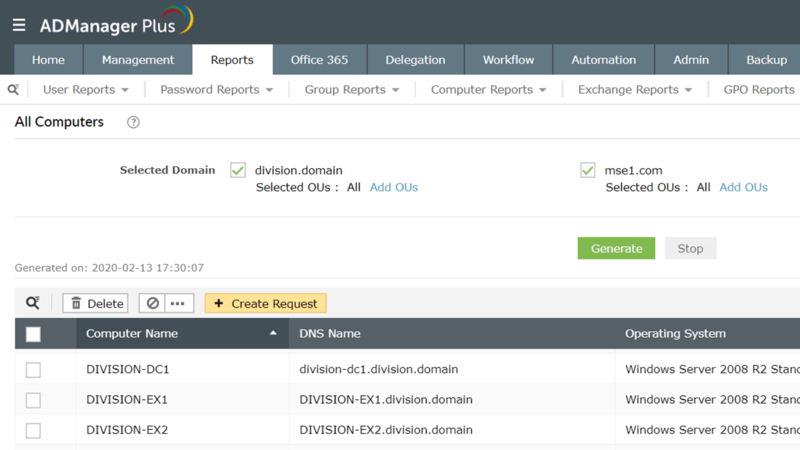 Especially since an environment with multiple domain controllers gives a different last logon time for each DC. 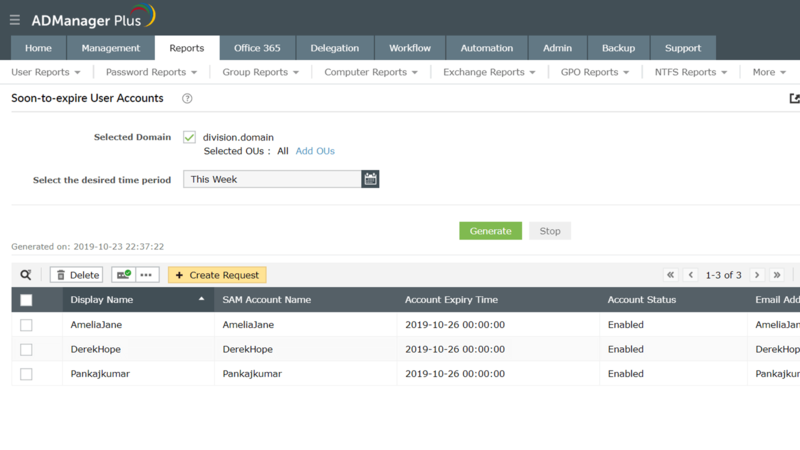 ADManager Plus simplifies this by querying all DCs so you can see which users have been inactive for a particular period of time. Delete or disable selected users. Move users to a specific container. User accounts that were never logged on to can create security mishaps, since they serve as potential entry points for attackers. While Microsoft Saved Queries help in identifying users who have not logged on to their accounts, getting the creation time for each user account is a complex process. 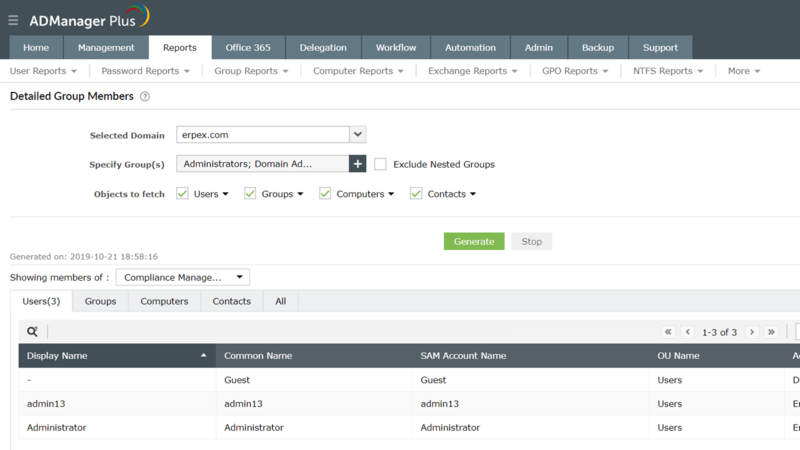 ADManager Plus displays not just the never logged on users, but also when each account was created. 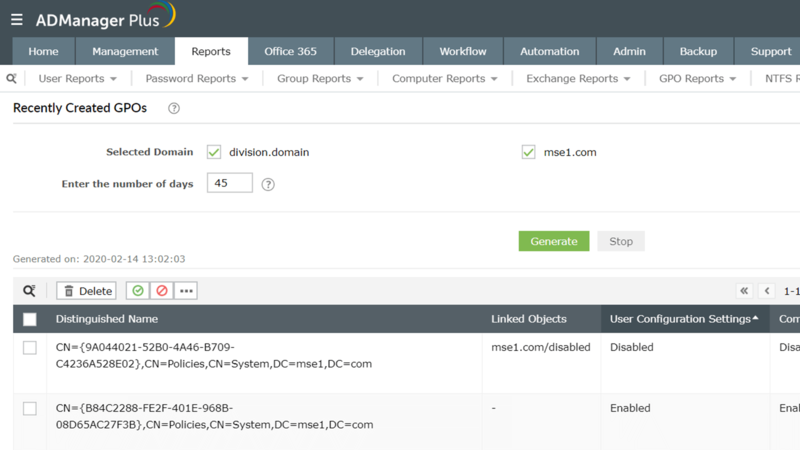 Additionally, you can enable, disable, delete, and move users that have never logged on right from the report itself. Identify the users who logged on to their account within the past N days. 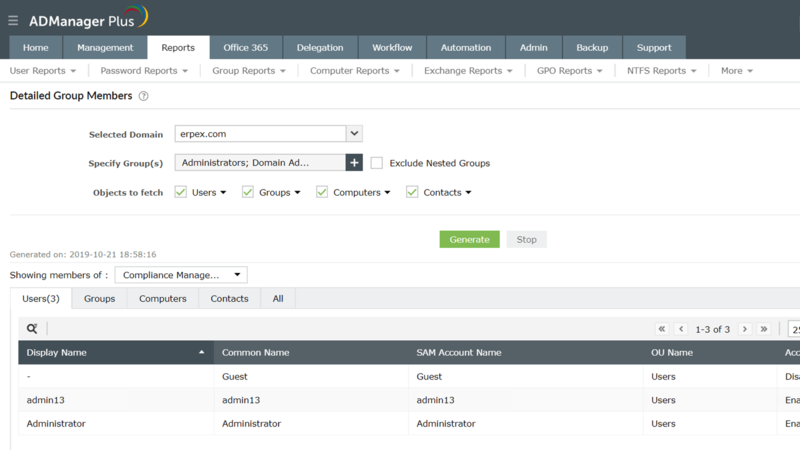 ADManager Plus queries all the domain controllers in your AD environment to determine when users last logged on. 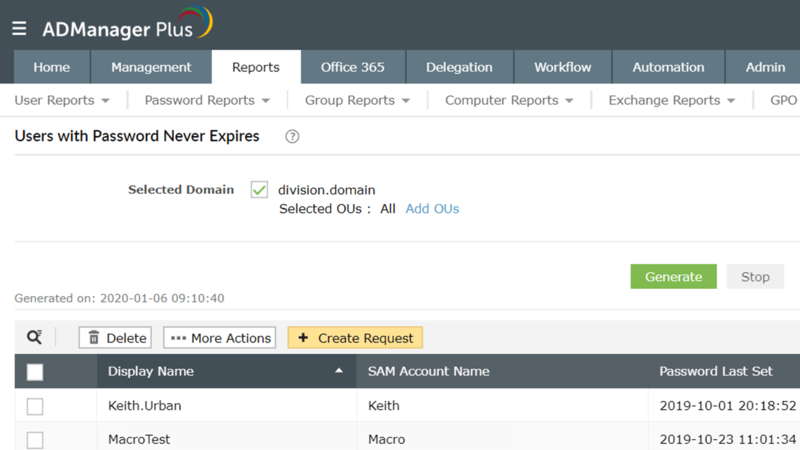 All you need to do is select a period of time and the domains and OUs you'd like to audit, and ADManager Plus will do the rest. 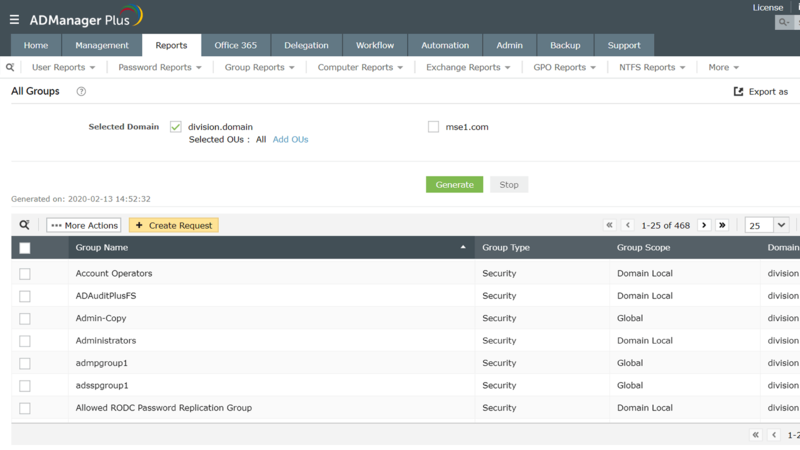 Get details about the members of both security and distribution groups, including nested members. 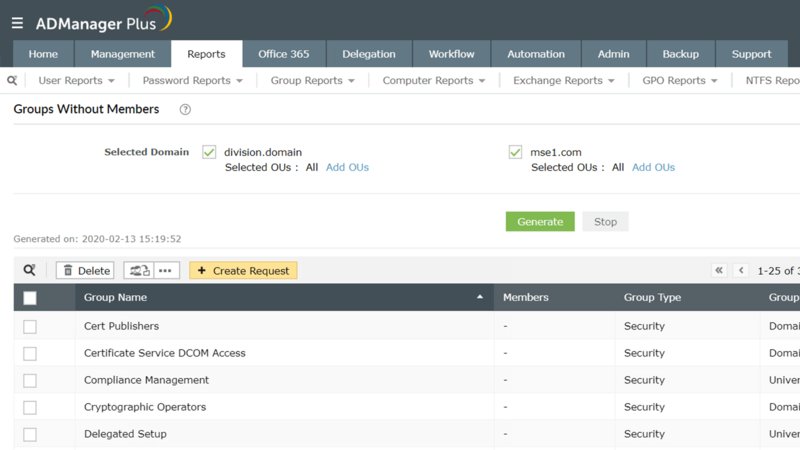 See which groups specified users belong to and manage the groups right from the report. 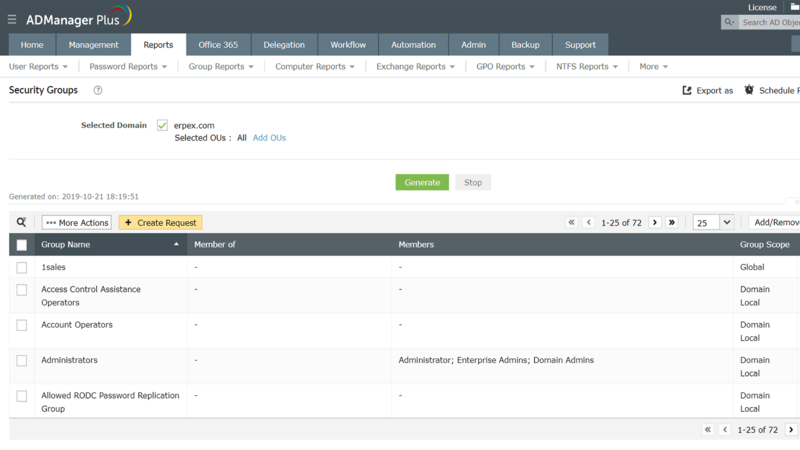 View information about groups that do not contain any members and delete or move them from within the report. 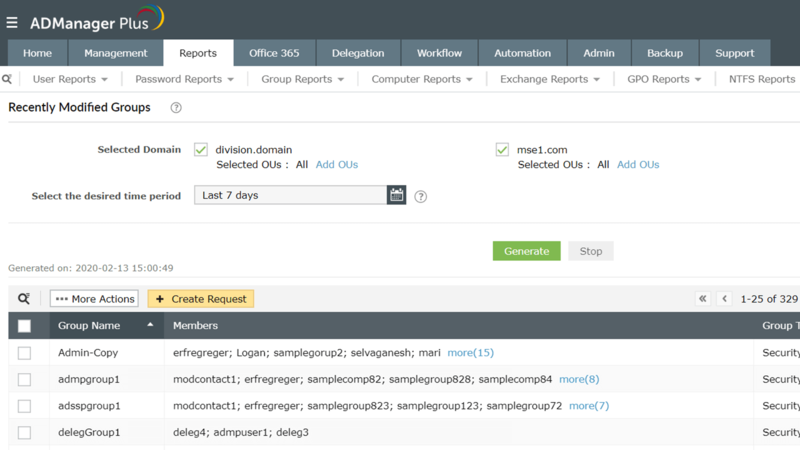 Identify users who are members of more than one group, excluding their primary groups. 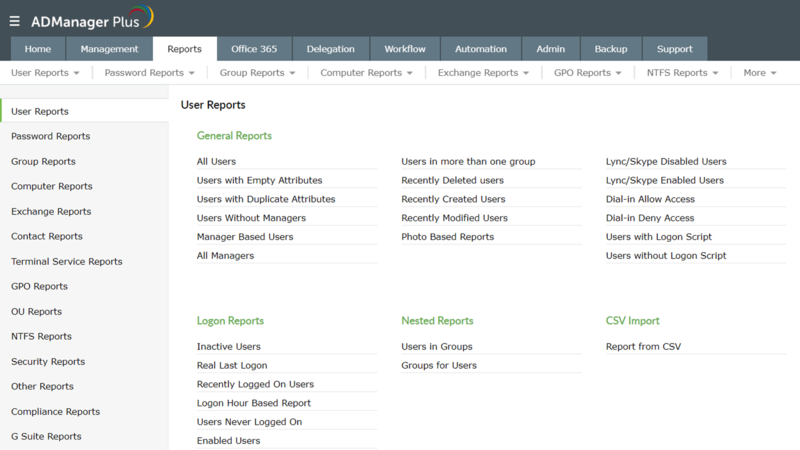 Manage these users from within the report effortlessly. 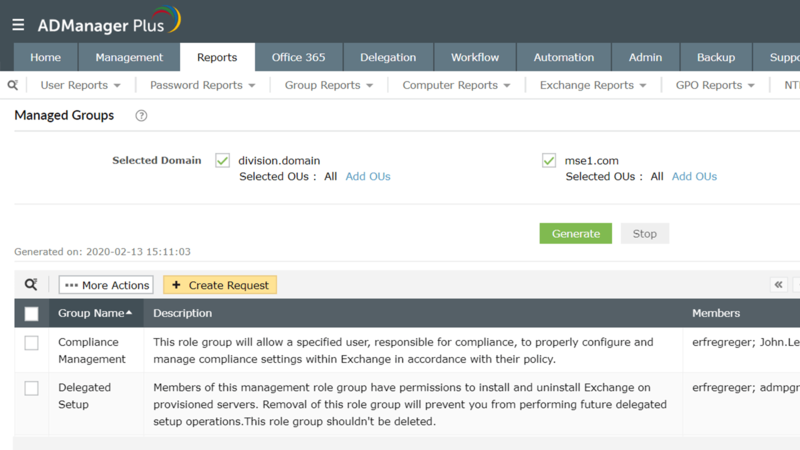 Get details about recently created, deleted, and modified groups, groups with and without managers, and more. Get information about groups based on their type (security and distribution groups) and scope. 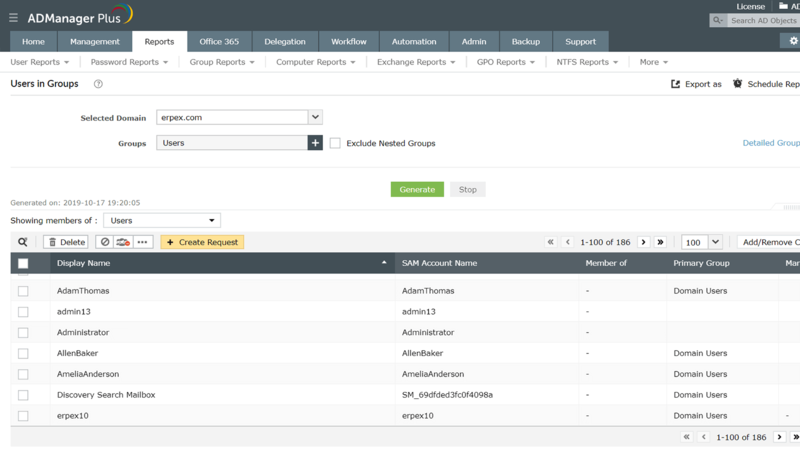 View information about all members of selected groups, including users, contacts, computers, and nested groups. Filter the results to both exclude and include certain kinds of users, contacts, computers, and group objects. Organize group membership information in a table, or view a summary of membership details for each object. Select a list of users and see which groups they belong to, along with detailed information about each group. View the name of the group, its entire member list, its domain name, and the group (if any) the group belongs to. 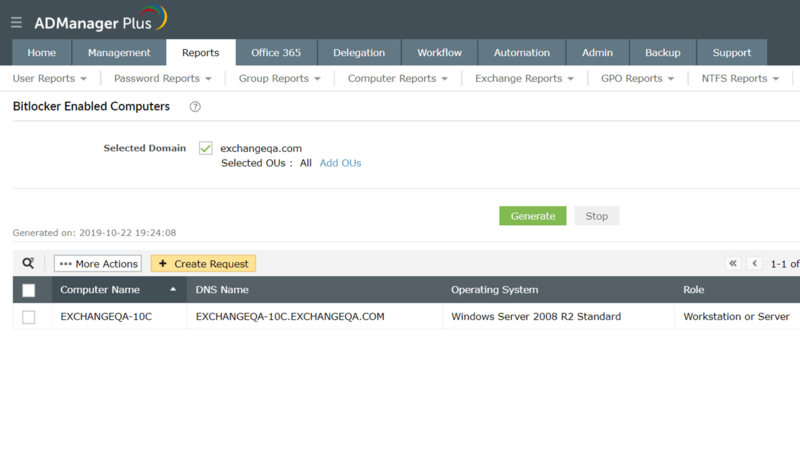 Modifying Exchange and organization attributes in bulk. Get information about groups in your organization that do not have any members, including details such as the group's name, type, scope, domain name, and more. This way, you can identify the groups in your domain that are no longer needed and decide how you wish to proceed. Modify groups' organization and Exchange attributes. View information about users who are members of more than one group, not including their primary groups. Get details such as the user's display name, SAM account name, groups they belong to, primary group name, manager, and more. 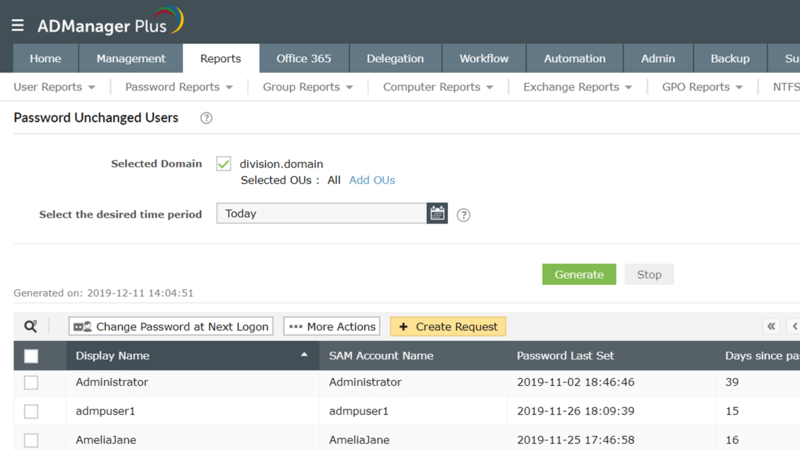 Manage users from within this report by resetting their passwords, enabling or disabling their accounts, modifying their SMTP addresses, and much more. View basic information about the groups in your organization. Get details about all the groups in any domain. 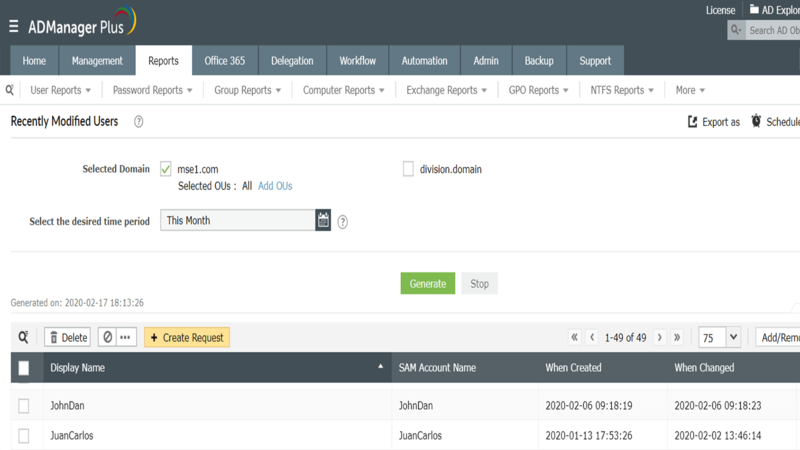 View groups that were created, modified, or deleted over a specific period of time. Find the groups with the largest number of members. Identify groups that have the Managed By attribute filled. View groups that don't have a manager. 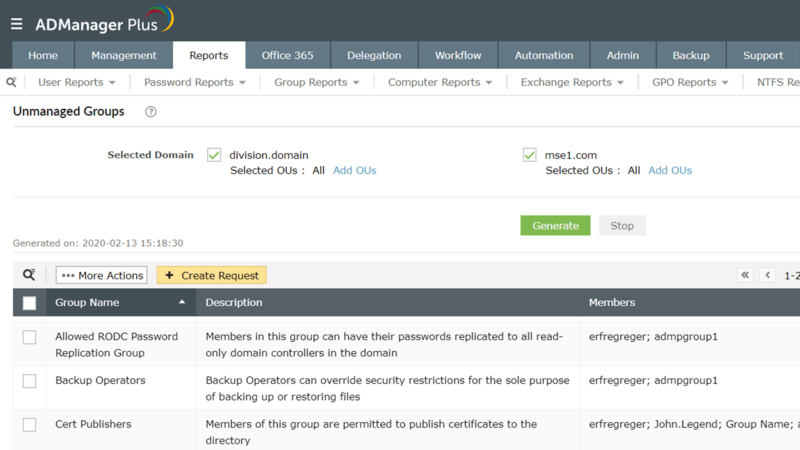 Get details about the security groups present in domains. 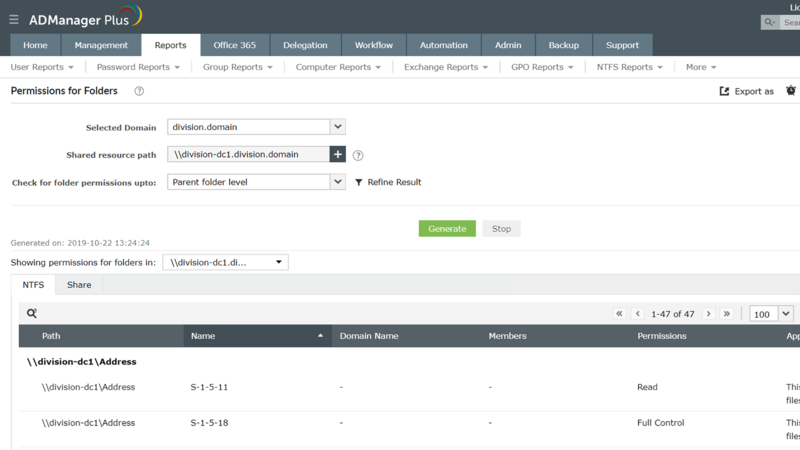 View information about the distribution groups present in domains. List groups based on both their type and scope. 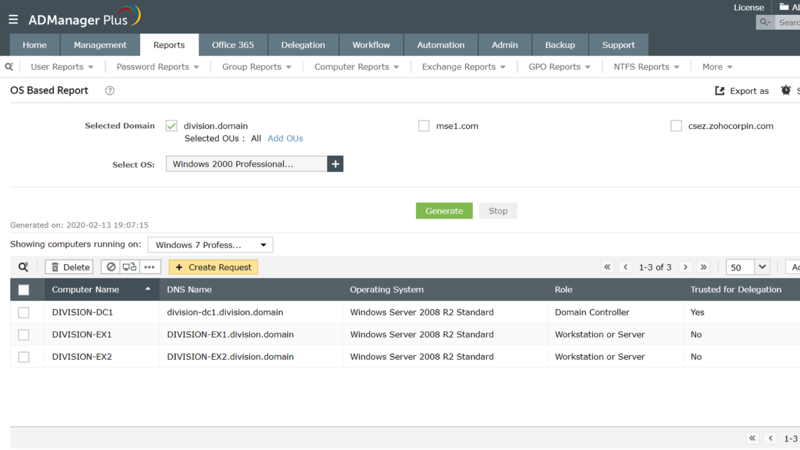 Get a complete picture of your organization's workstations, servers, and domain controllers. View a list of all computers in the domain that have been inactive for a specified time period. 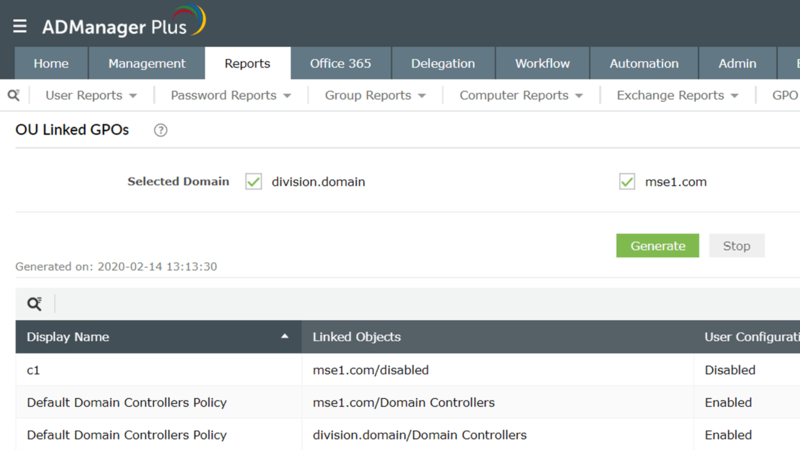 View all the computers that have been disabled for specified domains and enable or delete them right from the report. View information about the status of computer accounts such as which ones were recently created, deleted, or moved. Find out which computers users logged on to during a specified time period and manage those computers from the same console. View details about all the BitLocker recovery keys stored in AD and download the KeyPackage in the format of your choice. All computers: View information about all the computers in your domain. Workstations: List details about all the workstations in selected domains. OS-based computers: Get information about computers based on the version of their operating system. ADManager Plus lists detailed information about all computers that haven't been logged on to over a particular period of time. It queries all domain controllers in order to obtain this information. Optimize the number of computer accounts in your organization by deleting or disabling inactive computers. 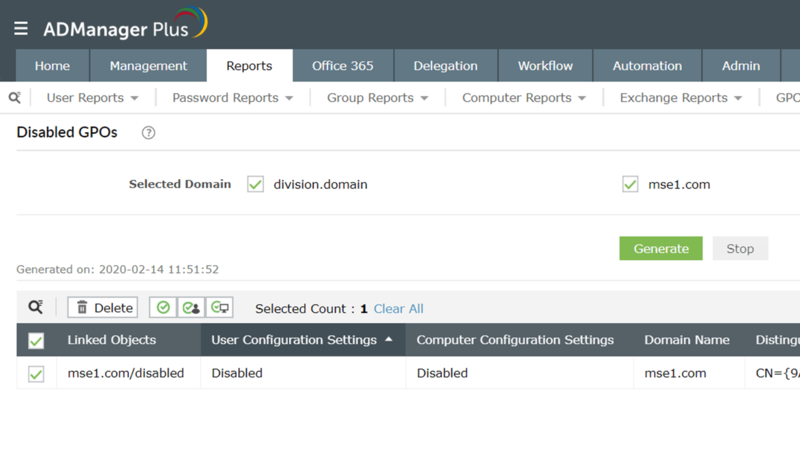 ADManager Plus not only lists out the inactive computers for you, but also helps you enable, disable, or delete them right from the report. You can also move or reset computers and modify their general and group attributes. Get detailed information about computers that have been disabled, including each computer's name, DNS name, OS, creation time, and more. Based on this information, you can decide if you want to delete the computers to free up some space or re-enable them. In addition to just viewing this information, you can also perform actions on these computers from within the report. Enable, disable, delete, move, or reset computers, or modify their general and group attributes as needed. Computers that were recently created, deleted, and moved. Computers that have a manager assigned to them. Computers that do not have a manager assigned to them. Additionally, you can also delete or disable computers directly from the report. You can also add computers to specific groups, reset or move computers, and modify their general and group attributes. See which computers users have logged on to in your domain within a specific period of time. View details such as each computer's name, DNS name, last logon time, role, operating system, and more. 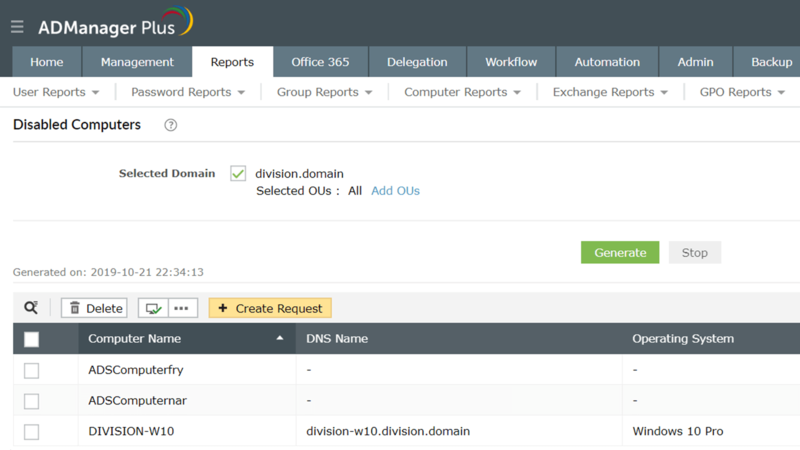 In addition to just viewing this information, you can also perform management actions right from within reports. Enable, disable, delete, reset, or move computers. Modify computers' general and group attributes. Fetch information about your computers' BitLocker encrypted drives, including their volume GUID, recovery GUID, recovery password, and more. Download the KeyPackage for each of your encrypted drives in the format of your choice. Having these details by your side will help you unlock and recover corrupted BitLocker encrypted drives using the BitLocker Recovery Tool (Recover-bde). 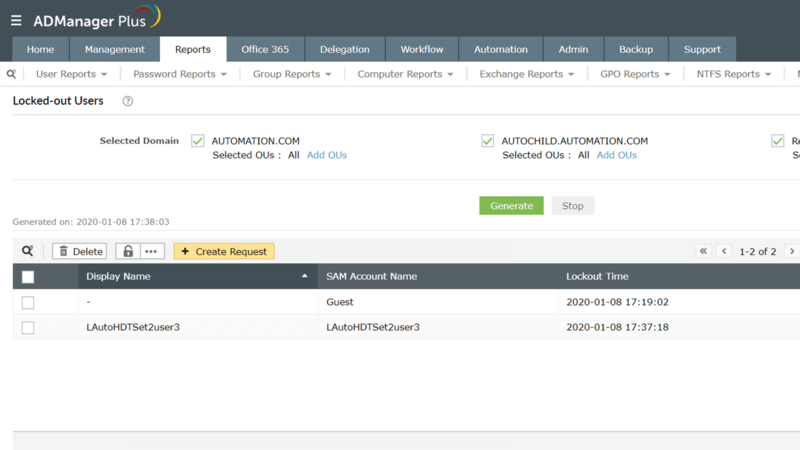 View a list of users whose logon attempts failed over a specified time period. Take a look at the user's display name, bad password time, password expiration date, when they last changed their password, and more. Make users change their passwords at their next logon. Raise a request for a task to be done on a selected user. View details about all users who haven't changed their passwords recently, including their display name, SAM account name, password status, expiration date, the time and date their password was last set, and more. Make users change their password at their next logon. List details about all the users whose passwords have expired including the user's display name, SAM account name, when their password was last set, its expiration date, and more. Set users' passwords to never expire. Modify SMTP addresses and mail storage limits. 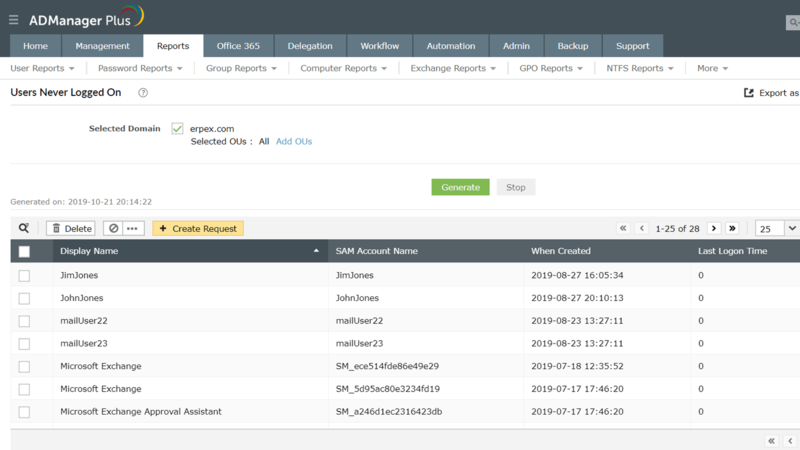 Identify users whose passwords are about to expire and notify them in advance to avoid frantic calls to the help desk. Ensure that selected users' passwords never expire. View complete information about users whose passwords never expire, including their display and SAM account names, the number of days since their password was last set, and more. View information about users whose passwords need to be changed the next time they try to log on. Review each user's display name, password expiration date, the number of days since their password was last set, and more. View information about users and groups who have access to folders in specified paths and prevent unauthorized access to folders. 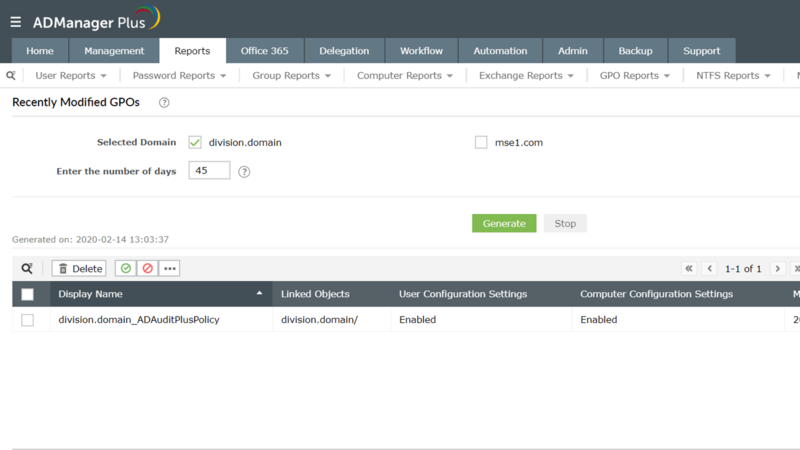 See which folders selected user accounts have permissions over and identify what kind of permissions they have. List users and groups who have access to selected servers. List the servers that can be accessed by specified accounts (users or groups) in your organization. Get details about folders protected from inheritable permissions to make sure that unauthorized accounts don't gain access to vital folders and directories because of inherited permissions. View all the permissions users and groups have over folders—including users' home folders—in specified paths in your AD environment. This report displays information such as the level of access a user or group has over folders and whether the permission was inherited or explicit. With this information by your side, you can prevent unauthorized access to folders which could lead to data loss and leaks in your organization. View information about all shared folders and their respective permissions. Use this report to ensure that only desired folders are shared. 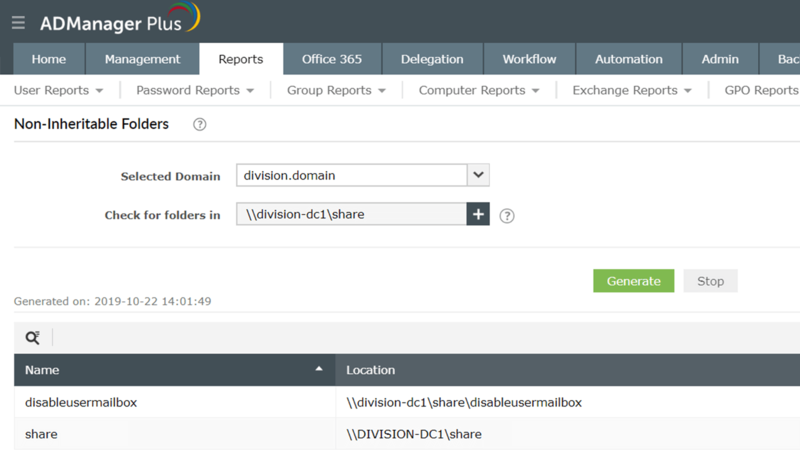 Audit the shared folders' locations, accounts (security principals) that have permissions over shared folders, the scope of the permissions (folder, sub-folder, etc. ), and more. View information about folders specified accounts have access rights over, including the folders' name, location, creation time, and more. You can check for folders in a specific path and filter the results based on access level (any control or full access). Review the folders that accounts can access to ensure that no account has unauthorized permissions over an important folder. Identify which AD users and groups have access rights over specific servers. View information about the server permissions, including the server and domain names, the type of object that has permissions over that server (user or group), what kind of permissions they have, and more. With this report by your side, you can completely secure your AD infrastructure. List all the servers that specific users and groups can access. View each server's DNS name, last logon time, role, OS, and more. View details about all the files and folders protected from inheritable permissions. Specify a path to generate a list of all the files and folders in that path that are protected from inheriting permissions from their parent objects. Look at each protected folders' name, creation time, location, and more. View information about Group Policy Objects (GPOs) and the AD objects linked with them. 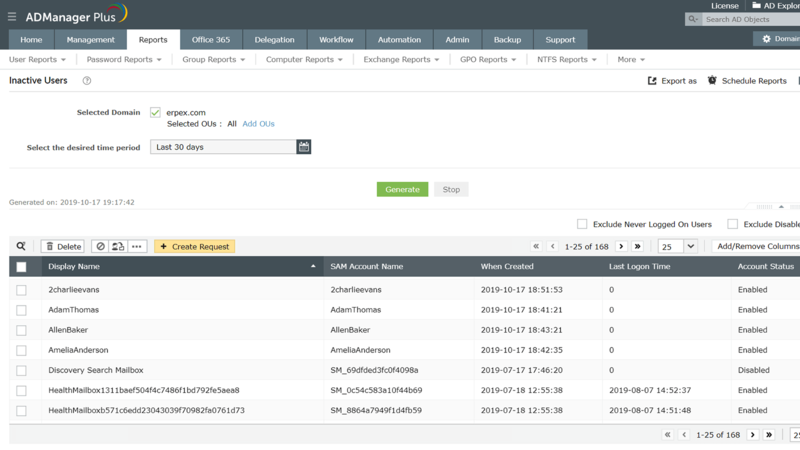 View details about the unused GPOs in your AD environment that are not linked to any OU. 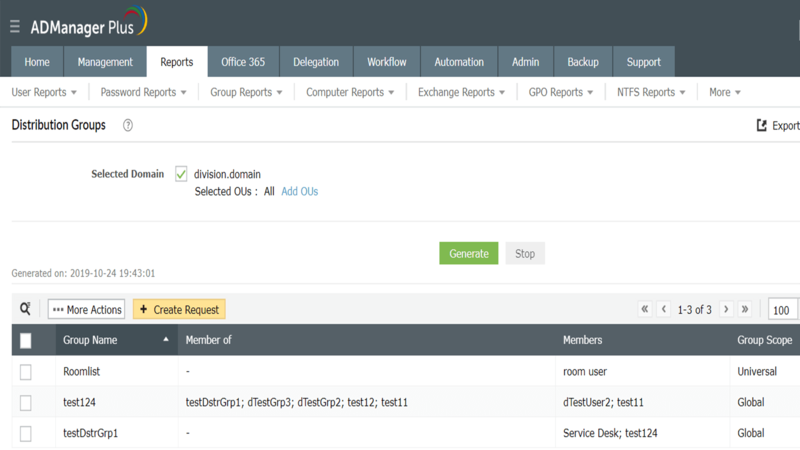 View information about all the GPOs that have been disabled in your AD environment. 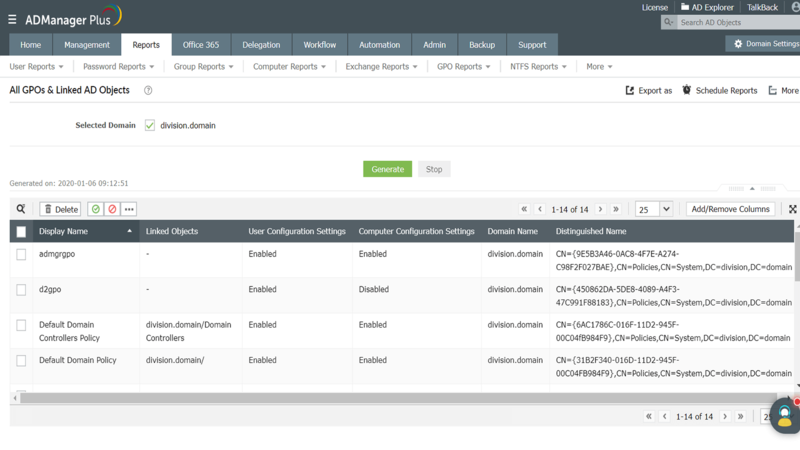 Identify and obtain advanced GPO-related information about site, domain, and OU-linked GPOs. View objects that have been blocked from inheriting GPO settings. 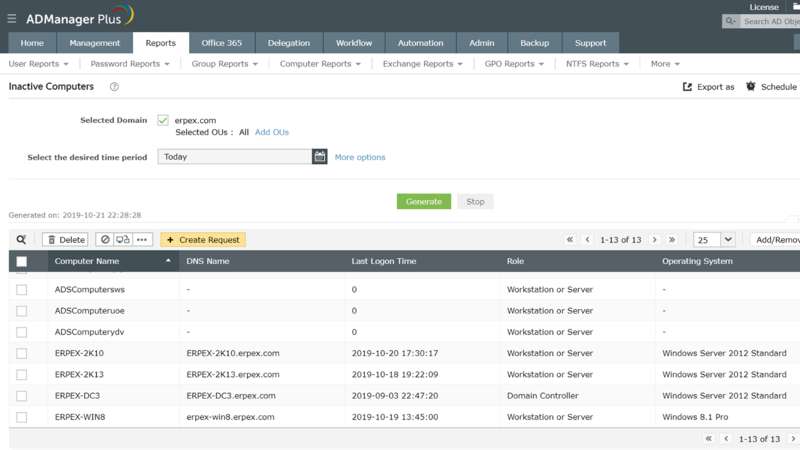 View all GPOs and the AD objects linked with them, including details such as the GPO's display name, linked objects, user and computer configuration settings, creation and modification times, and more. 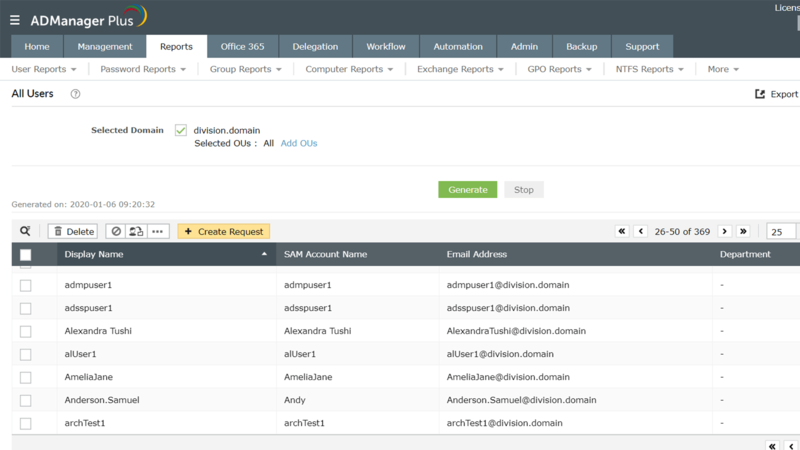 Identify all the GPOs that are not linked to an OU in your domain. Once you've located the unlinked GPOs, you can clean up AD effortlessly. 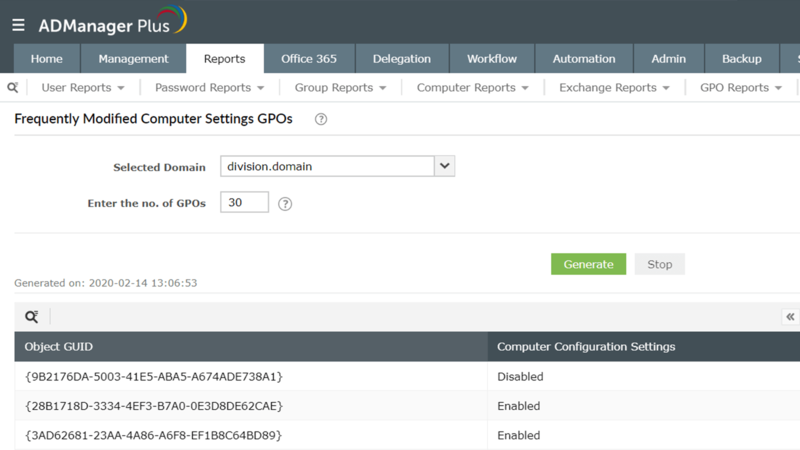 Find details such as each GPO's display name, linked objects, user and computer configuration settings, domain name, and more. 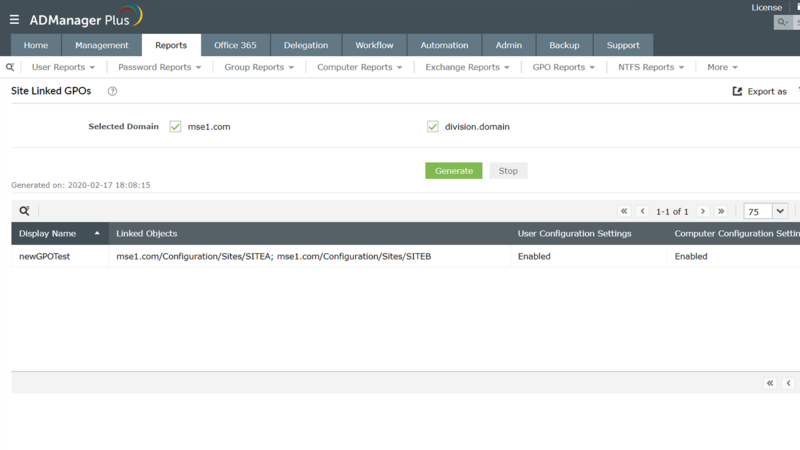 Identify all the disabled GPOs present in your AD environment. 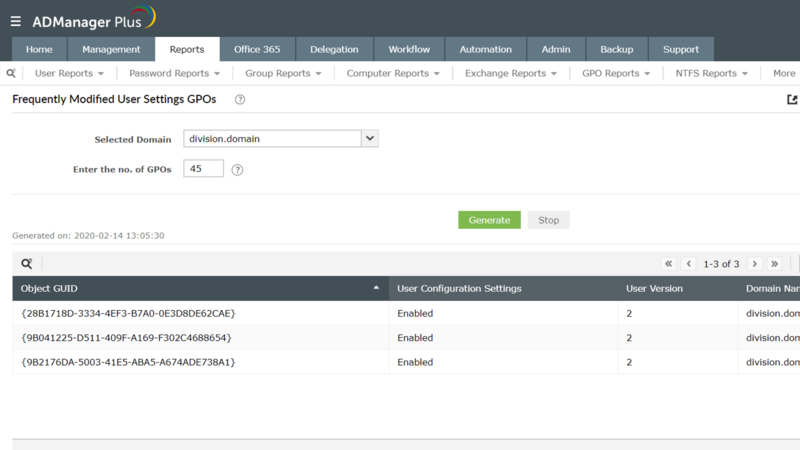 View complete details about all the GPOs that have been disabled, including their display name, linked objects, user and computer configuration settings, domain name, and more. Check frequently modified user and computer settings. Identify disabled GPOs with user and computer settings. View GPOs that are linked with a domain. Identify GPOs that are linked with OUs. Discover GPOs that are linked with sites. Get detailed information about objects with blocked inheritance, including details such as their display name, linked objects, user and computer configuration settings, domain name, and more. 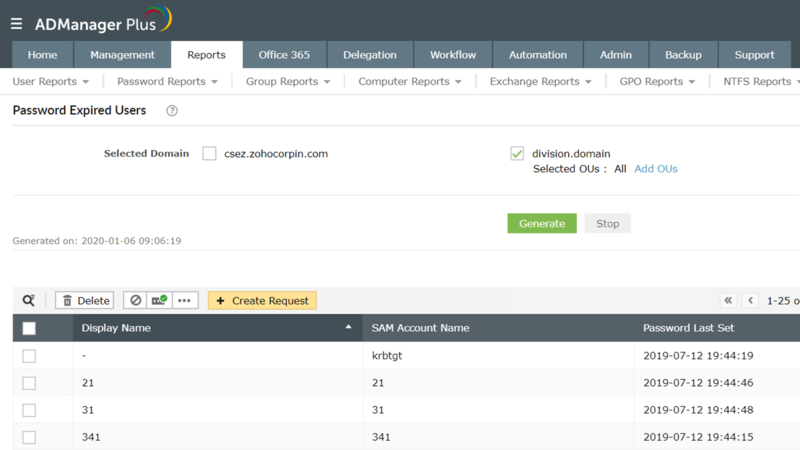 ADManager Plus extracts detailed information about your AD, Exchange, Office 365, and G Suite infrastructure and displays this vital data through its straightforward reports. 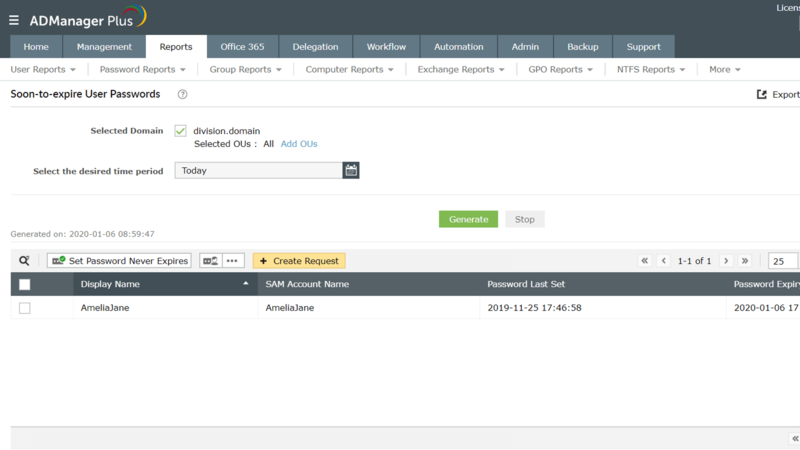 In addition to checking every nook and cranny of your AD and reporting on it, ADManager Plus also allows you to perform management actions right from the reports themselves. Schedule any one of ADManager Plus' pre-packaged reports to have them emailed to you at specified time intervals. 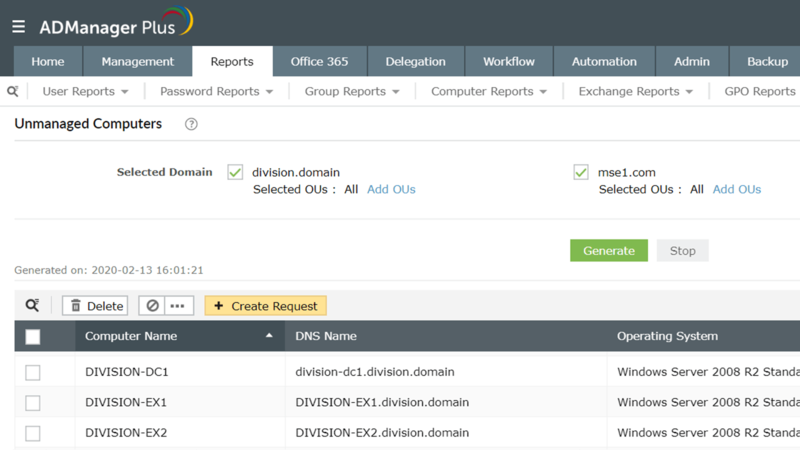 ADManager Plus provides us a single point for our Active Directory Reports. For a small IT department this is crucial for saving time and being able to apply our energy to keeping things running smooth. I foresee this being in our arsenal of network tools for a long time to come. ADManager Plus benefits our organization in several ways. We use it for reporting on user access returning a very granular report. 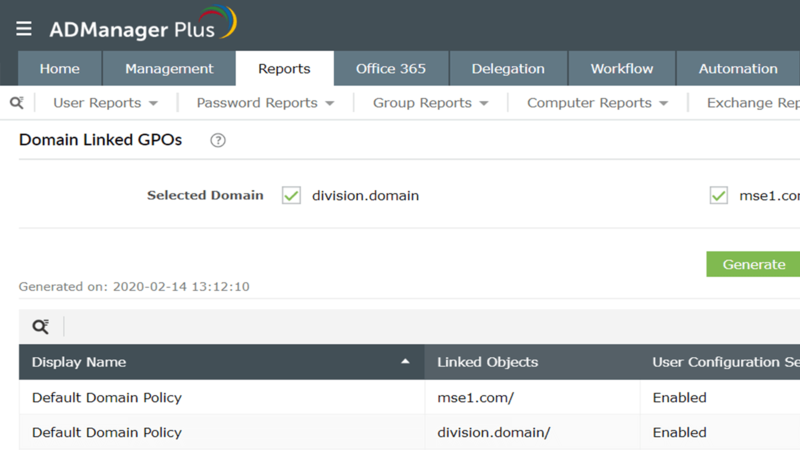 The processes it streamlines makes my time with ADManager Plus more efficient. - Bill Mead,Network Administrator/Engineer, Parkview Medical Center, Pueblo, Colorado. We are an IT outsource company, for our monthly reporting and audit purposes we needed to draw scheduled reports as well as be able to make bulk changes. ADManager Plus has automated many manual processes and reduced risk of incorrect reporting formats. It was able to provide the answers we specifically sought from a reporting and audit perspective. - Sugan Moodley,Service Delivery Manager. 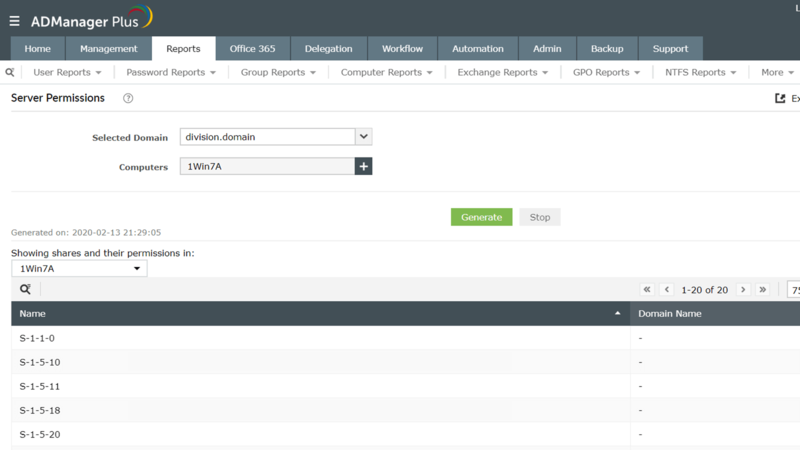 ADManager Plus' reports by your side! ");$(".icnn1").html(" ");$(".icnn2").html(" ");$(".icnn3").html(" ");$(".demLnk ul").html("
");$(".topHead .per50 a.logo").html(" ");$(".footer .per50 ul").html("